Can I fold it away? Whether you’re a dedicated cyclist or just looking to get into better physical shape, an indoor bike trainer can help you out. There are a lot of different makes and models on the market in 2019, ranging from those that provide a simple stationary housing for your bicycle to more complex bike trainers that replace the whole wheel of your bike to even full sets of equipment, no bike required. This last category is what we’re going to be looking at below. Bike trainers are a busy and rapidly growing market and picking the right one for your specific needs can be intimidating. With the help of this guide, you will be able to pick out the ideal bike trainer for your needs with confidence that you’re making the most informed decision possible. The Ancheer-M6008 is a standalone piece of equipment, setting up easily in any indoor space. It’s relatively small and unobtrusive, not dominating the room, and the design is clean and pleasing. It has easily adjustable resistance, enabling you to customize your workout to fit your personal needs, as well as a fully adjustable seat and handlebars. 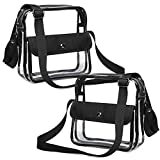 It also has sturdy foot straps and an emergency stop, just to make sure that you stay comfortable and secure. The Ancheer-M6008 is designed to fit whatever your needs are, getting out of the way and letting your personal workout remain the focus. Why We Liked It – Attractive, adjustable, and comfortable. What’s not to like? The Ancheer-M6008 can fit pretty much any lifestyle and can adjust to your changing needs. The XTERRA FB150 is a small, folding exercise bike that can be easily set up and put away as needed, ideally fitting a small workout space or mobile lifestyle. The seat and handlebars are fully padded, ensuring more comfort than might be expected from such a compact folding bike, and the resistance is easily adjusted with a large manual tension knob, allowing the XTERRA FB150 to fit the workout needs of users of all fitness levels. It is sturdily built, secure, and reliable, supporting active and mobile lifestyles, and should be more than able to survive regular assembly and disassembly. Why We Liked It – The XTERRA FB150 is ideal for anyone who moves around a lot in daily life or lives in a small enough space to need a collapsible exercise bike. 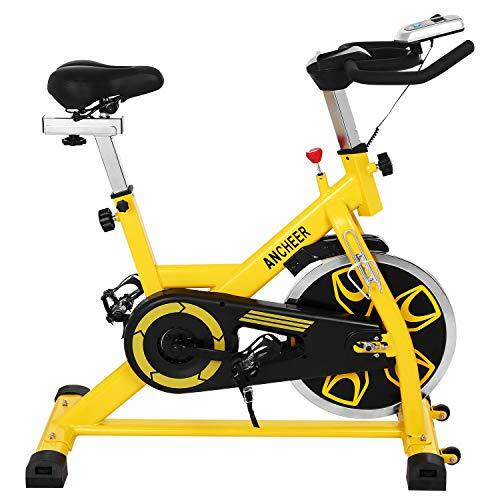 The ANCHEER-B3008 is a high-quality, sturdily built bike trainer, equipped with its own flywheel for a more natural riding experience. The extra wheel gives it a feel more like riding a regular bicycle, but with all the convenience of a bike trainer. Like many other bike trainers, the ANCHEER-B3008 has a manual tension knob to adjust the riding experience to fit your level of fitness, but in this case, the knob also functions as a quick brake stop. The pedals are even equipped with toe cages rather than the more typical straps – this is a premium piece of workout equipment on every level. Why We Liked It – The ANCHEER-B3008 stands out from the crowd with its added flywheel, offering a far more natural riding experience than the vast majority of bike trainers. It’s a sturdy and high-quality piece of design intended for the best ride possible. 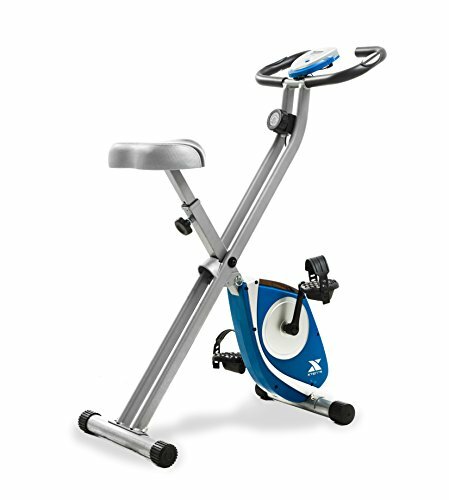 The YOSUDA stationary bike trainer is another premium design with its own flywheel for a more natural ride. This one, though, is designed with safety and security at the forefront, supporting a maximum user weight of 270lb and coming with full toe cages and an emergency brake. It also has transport wheels, enabling easy movement of what could otherwise be a somewhat cumbersome piece of equipment. The padded seat and handlebars are fully adjustable, as is the tension of the bike, ensuring that the YOSUDA bike trainer can work for any size of the user at any fitness level. Why We Liked It – The transport wheels here add a lot of flexibility to the YOSUDA stationary bike trainer, enabling it to be more easily transported than other heavy-duty premium bike trainers. The JOROTO bike trainer is a flywheel-equipped bike, designed for a natural-feeling ride and a comfortable experience. It is exceptionally sturdily built, designed for a maximum user weight of 280lb, with extra-strong construction bars and stable triangular frame design. Strong enough for vigorous use, the bike is still adjustable enough to fit the workout needs of a more casual user, with manual tension adjustments and adjustable handlebars and seat, movable in a full four directions for added customization. A model with an extra-wide seat is also available, ensuring that any user can remain comfortable. 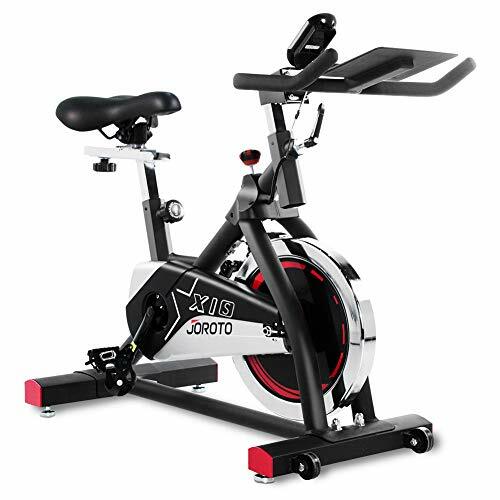 Why We Liked It – The JOROTO bike trainer is sturdier than most options on the market, offering a smooth and natural user experience even for larger users or those intending on a more vigorous workout plan. The Exerpeutic folding bike trainer is a substantial piece of kit, but can still fold into a relatively small space, collapsing to approximately half the size of the fully erect setup. Adjustable to fit users ranging in height from 5’3” to 6’1”, the bike has an exceptionally large seat cushion, ensuring the comfort of users of any size and weight. 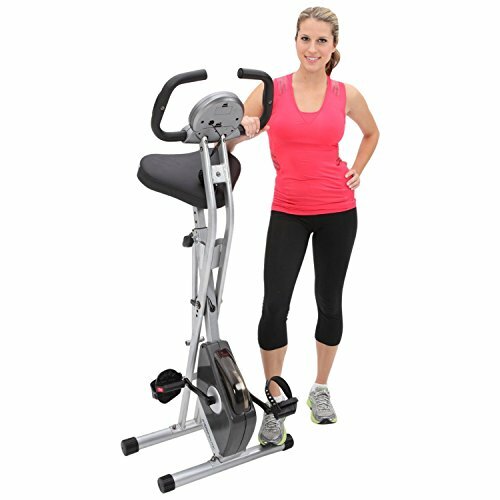 Coming with a full eight levels of tension, the Exerpeutic bike trainer can work with any fitness level as well as any size of the user. It also comes with pulse sensors in the handlebars, easily monitoring your heartbeat throughout your workout session. Why We Liked It – The Exerpeutic folding bike trainer may look large and impressive, but its folding design helps it to remain unobtrusive and easy to pack away. The Marcy Recumbent ME-709 bike trainer is larger than many other bikes, designed for a comfortable recumbent riding experience. As such, the seat is large and comfortable, equipped with an upright back for added support when reclining. This bike trainer takes up a large amount of space, dominating most rooms, but that’s more than made up for by the luxury and comfort of the riding experience. The pedals are weighted, ensuring ultimate control of your ride, while the large LCD screen mounted above them displays comprehensive information, covering time, speed, distance, and calories burned. 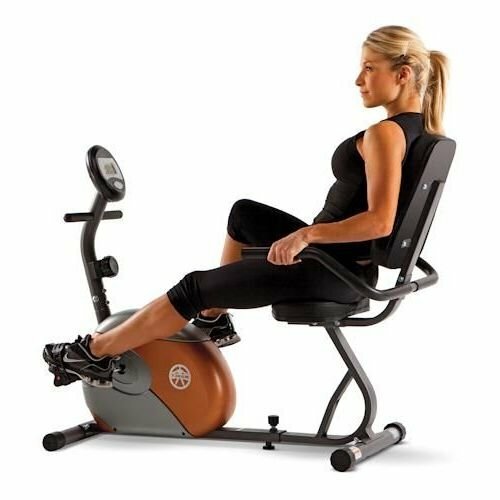 Why We Liked It – The Marcy ME-709 recumbent exercise bike trainer is a large, comfortable exercise bike, designed for maximum comfort and confidence in your workout. Plus, it is significantly more attractively designed than most large bike trainers! 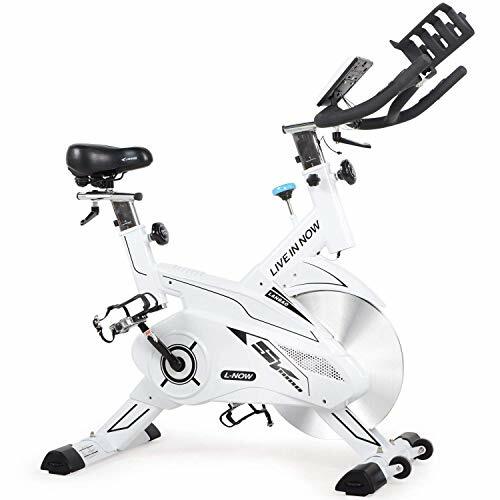 The Marcy Club Revolution bike trainer is designed to support intense cardio workouts, remaining stable throughout even the most high-intensity workouts. The frame is made from durable, rust-resistant steel, while the design and construction are sturdy and heavy. 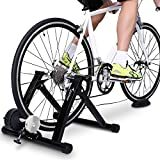 This bike trainer provides a riding experience as close as possible to that of a road bike, offering the same stability and quality construction as a professional gym bike trainer. The seat is ergonomically designed to be comfortable while also as similar as possible to that of a road bike, and the frame is sturdy enough to ride in the standing position of an intense road bike ride. Why We Liked It – The Marcy Club Revolution bike trainer is stronger and sturdier than most, allowing for more intense workouts closer to those possible on a professional gym exercise bike. The NOW bike trainer is a heavy-duty product with a flashy, futuristic design sure to stand out in any home. Constructed with a belt-drive system, this bike trainer promises a uniquely smooth, quiet workout experience even at higher intensities. It is also a longer-lasting design than most, requiring oiling and repairing far less often than the majority of bike trainers. It also offers an LCD monitor to show information covering time, speed, distance, calories burned, and heart rate measured through handlebar pulse sensors, as well as multimedia, stand large enough to house an iPad or other tablet devices. Why We Liked It – The NOW bike trainer looks better than most exercise bikes in its category and offers a smoother and quieter ride. This is also a sturdy and stable product, allowing for intense workouts as well as more casual home use. 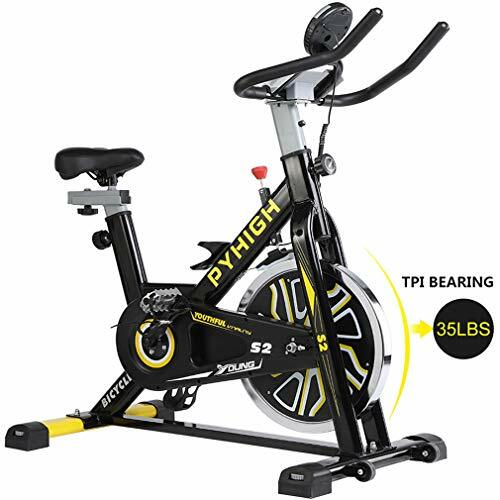 The PYHIGH bike trainer offers a bidirectional flywheel construction, allowing higher momentum and a more challenging exercise experience than other bike trainers can provide. Its resistance is still manually adjustable, though, so if you don’t feel confident with a more challenging routine, it’s still a great choice. The saddle for the PYHIGH bike is extra-large for added comfort and offers unique heat dissipation properties to keep you cool through even the most intense of workouts. The LCD monitor mounted between the handlebars offers a comprehensive set of information about your workout, while the phone holder allows entertainment during exercise. Why We Liked It – The PYHIGH bike trainer is designed with comfort at the forefront, keeping you cool through your workout. It is adjustable and easy to use, and the bidirectional flywheel offers a higher maximum challenge than many other bikes. One of the largest choices to make when choosing your ideal bike trainer is that of the amount of space you are willing to offer for your bike. Some of these are large, attractive objects that will dominate any household room, while others are designed to be unobtrusive or easily folded and packed away out of sight. Do you travel a lot, or work out in a smaller room that gets used for other purposes during the day? Then perhaps one of the folding models with transport wheels, or lighter-weight collapsible bike trainers might be the ideal fit for you. Alternatively, do you have a dedicated workout room and an intense cycling plan? Then one of the larger, heavy-duty models with a focus on stability and power might be a better fit. How do you prefer to ride a bike? Seated upright? Reclining? Standing up? 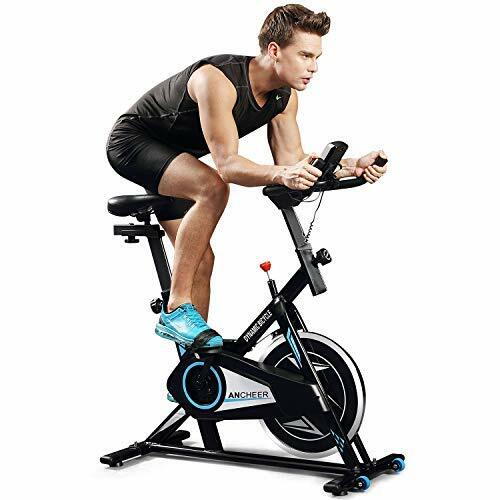 There are bike trainers to suit all of these approaches, from large, luxurious reclining exercise bikes to lightweight upright bikes and heavy-duty equipment suitable for standing upon. Before purchasing a bike trainer, it is worth considering what your preferred posture is when riding a bike and choosing the model that best fits your preference. Reclining bike trainers also take up substantially more space than upright ones, requiring enough room for the rider to lie down, and so provide more of a luxurious option for those with room to spare. No model of bike trainer should be actively uncomfortable, but some have more padding than others. Consider the size of the seat and its padding, as well as the ergonomic design of both the seat and the handlebars. All of these factors affect your comfort when exercising on a bike trainer for extended periods of time, and so are worth thinking about before you purchase anything. Additional comfort features are also worth considering – certain models come with heat-wicking seat cushions, adding to the potential comfort of a long ride. Many bike trainers offer screens to show feedback on your workout. Most of these will show speed, distance, and calories burned, but only some come with the handlebar pulse sensors to show your heart rate in real time. If that’s information you particularly care about, it may be worth splashing out on one of the more premium models of an exercise bike. Many also offer phone mounts, enabling you to watch videos or listen to music while exercising, but only some of these can be adjusted to fit a larger tablet or iPad. Depending on your preferred video platform and how much you care about mid-workout entertainment, this may be an important consideration. The technical mechanisms of bike trainers also vary between models. Some have simple single wheel structures, while others offer flywheels that mimic the two-wheel chain-linked structure of a road bike. Single-wheeled bike trainers will take up less space in your home, packing away more easily into a confined space, but flywheel-equipped models will offer a riding experience closer to that of a road bike. This is particularly apparent when it comes to acceleration, with the dual flywheel model spinning up in a much more natural and comfortable manner. 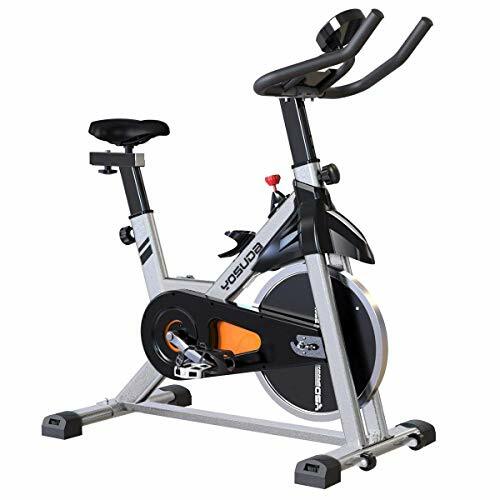 Some of these flywheel models are adjustable, with two possible wheel arrangements, offering a higher maximum challenge level for those who want an even harder workout. These tend to be the higher-end models, however, and the regular flywheel versions are likely to be sufficient for most purposes. If you’re a dedicated cyclist in search of extreme practice within the comfort of your own home, however, then a bidirectional flywheel model may be just the thing for you. Many of the bikes listed above only support users weighing up to 270 to 280 lbs. If you’re heavier than this, you’re going to need to take that into account and purchase one of the sturdier bike trainers available. This is an important safety consideration and one which could easily be overlooked. If you are particularly safety-conscious, however, you may wish to consider a model that offers full toe cages rather than flimsier straps, ensuring that your feet stay firmly in place on the pedals without slipping off during more intense workout sessions. Most models also offer emergency stop knobs (often as a secondary function of the manual tension adjustment knob), allowing you to bring the bike to a halt mid-ride in case of emergency. Some of the lighter models can be folded up and packed away, clearing them out of the room when not in use. The more heavy-duty models for larger users are unlikely to fold like this, however, focusing more on stability and strength than on space. The reinforced steel tubing of the larger models can be exceptionally strong, allowing for much more extreme workout plans, but does not lend itself to foldable designs. Contrastingly, the foldable options don’t offer the same stability as the larger models, and therefore run the risk of collapsing under more energetic exercise or larger users. In between these two extremes are models with wheels, allowing slightly more sturdy bike trainers to be pushed aside into the corner of the room. The lighter, more foldable models mentioned above can be transported from place to place. Some of the heavier models describe themselves as having “transport wheels,” but these are designed more for transporting the bike trainer from a storage corner to an active position in the room, rather than for moving the bike from one building to another. Most of these bike trainers are going to be challenging to move (some more so than others) and may well dominate smaller rooms. The bike trainer market is large and complex, but this list offers some of the best models available in 2019. All of these have their strengths, and your personal needs and exercise preferences will determine which bike trainer is right for you. Whether you want to prioritize high-intensity exercise or easy portability, there’s an exercise bike to fit your needs out there. Some are small and light, while others offer a smooth experience more like that of riding a road bike; there is no single set bike trainer experience. Everyone has different priorities and considerations, and the market is broad enough to allow for all needs, although many of the options are fairly large and sturdy. Considerations such as space are going to limit your buying options more than other categories such as additional features and screens. Hopefully, this guide has served to clear up which bikes fit your personal exercise needs best, enabling you to make a choice with confidence.